The majority of Americans, 58 to 30 percent, believe the Iran nuclear deal will make America less safe. (YURI GRIPAS/REUTERS/Newscom). 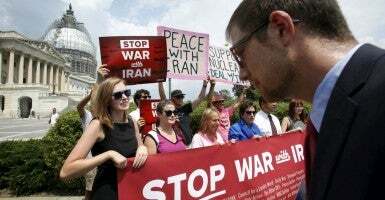 According to a recently released poll from Quinnipiac University, Americans strongly oppose the Iran nuclear deal. The majority of Americans, 58 to 30 percent, believe the deal will make America less safe, according to the poll, released Monday. The study indicates that 86 percent of Republicans oppose the deal, while 52 percent of Democrats support it. “There’s not a lot of love for the proposed nuclear deal with Iran. Only a bare majority of Democrats support the pact,” said Tim Malloy, assistant director of the Quinnipiac University Poll. The nuclear deal, negotiated between Iran and the P5+1—the U.S., France, Germany, Britain, Russia and China—limits Tehran’s nuclear program in exchange for sanctions relief. Congress has a 60-day review period to accept or reject the deal by Sept. 17. The Obama administration has argued that the U.S. will face international isolation and degraded security if Congress rejects the deal. But opponents like Peter Brookes, senior fellow of national security affairs at the Heritage Foundation, say that the deal is risky, and, as the Quinnipiac poll demonstrates, raises concerns for Americans.